What Is Good Management? 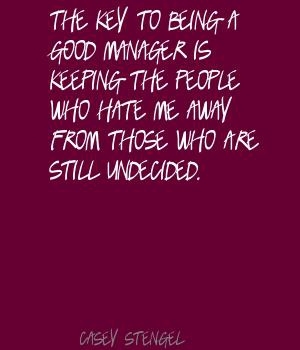 Learn from Good Manager Quotes! Lao Tzu has defined it in quite a spiritual sense. This is a kind of witty good manager quote, isn't it? Ellen Wacker has her own words to define it. Decisiveness is a must quality for becoming a good manager. Good management is about enabling people to achieve what they think they can. A good manager knows how it all feels like doing things. With computers, good managers get better and bad managers get worse. He thinks more about his people. 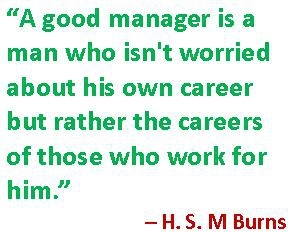 A good management is also about managing people the right way. He/she knows exactly how to make people want to do their work. The good ones often get high pay. Maintaining healthy relationship is crucial. Even James Blunt recognizes the value of a truly good manager. Actually, his/her productivity lies in his people's productivity. Often found in leading and encouraging roles. Popularity and skills are two different things. 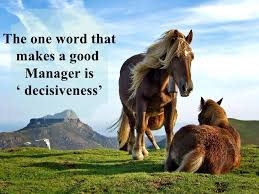 It requires cleverness to be a truly good manager. 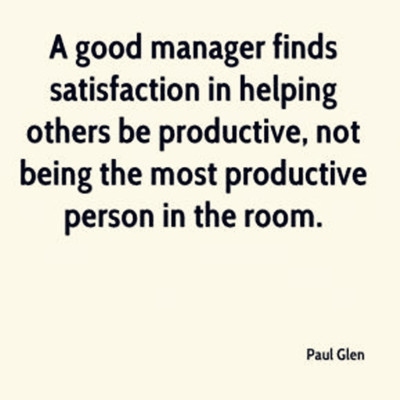 One of my favorite good manage quotes. Improve efficiency of the whole team. Server responsed at: 04/23/2019 4:40 a.m.